- Gentle contours on the edges and rounded corners coupled with soft bends in the 14 ga. steel tubing ensure safety and comfort for all users. - This solid single surface won’t scratch or dent over time. It includes a built-in pencil groove to complement the angled top that enhances reading and writing. - The footrest is the key to standing comfort. Our patented design utilizes multiple depths and two heights to support the user’s feet while sitting and standing. The chrome plating ensures lasting durability and easy maintenance. 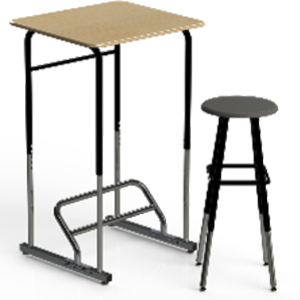 - This desk will grow to meet any student or grade level requirement. Desk Height: 34" - 42"